Military spouses on the home front are just extraordinary and adaptable as their counterpart spouse who is in the military. Each military family willingly sacrifices parts of their life’s, to allow their family member in the military to protect and defend the United States of America. On the home front as a military spouse it can feel like you end up dealing with realities you didn’t expect to face. Feelings you thought you could handle may bubble forth and you really can’t believe it. No matter what, you can choose to look at the positive or the negative. Always try to look for the positive we only get one life to live and I think it’s important to cherish and enjoy every single moment you can. Some days you will see more negative and some days you will see more positive. You have to be the change you want to see in the world as the saying goes and its true. We support our spouses while they keep our country and they support us. Of course, we have friends and family who also play a vital role in support us while they are away. Everyone whether in the military are not can face harsh realities in life. 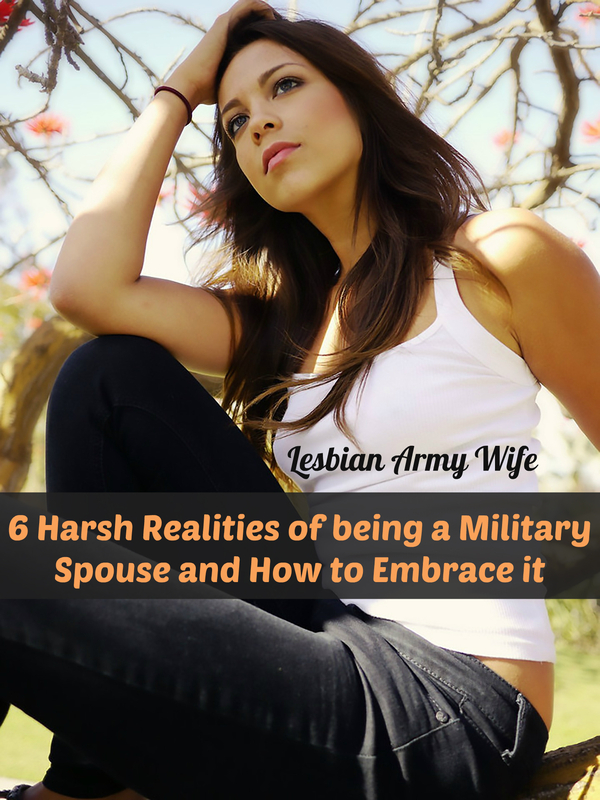 You and I as a military spouses are not exempt from life’s harsh realities. We face unique and challenging realizations often, but we can embrace these harsh realities if we can look on the bright side of things. 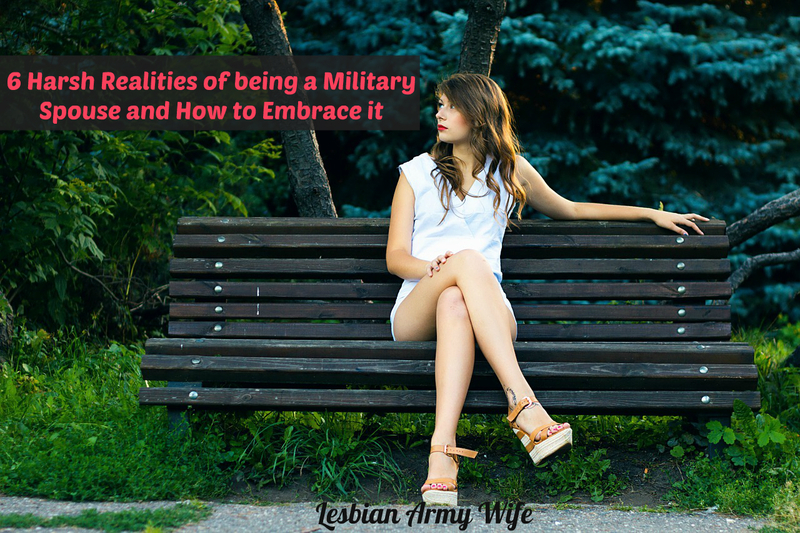 I have created a list of harsh realities some military spouses face and ways to embrace those realities. You sacrifice a lot (holidays, birthdays, family time & anniversaries) but embrace it by using technology and creativity to connect with your spouse. Send Care Packages if you spouse is deployed. Try out new technology called Pillow Talk that allows you to hear your spouses heart beat no matter where you are. Create personalized photo books, jewelry or bracelets. You give up possible career advancement and jobs but in embrace it by finding your passion or working around your spouses career. Decide if you want to work or not. What do you love to do? Decide if you should move with your spouse are not. What’s best for your family? Decide if you want to own your own business or not. What do you ultimate want from a career? Look for ways to share what you love to do with others. You forgo long vacations but embrace it by taking mini-vacations or weekend getaways and make memories because life happens now. Where is somewhere you have wanted to go recently? Do some research and find a place where you can get away for the weekend. Have you moved to a new place? Are you near mountains or a lake? Are you near a theme park, spa, or local hot spot? Where ever you are find short vacation spots and go on these types of day or weekend trips more often. Maybe you can go on an extended vacation but you can still go on short trips. Learn more about Military Leave to understand when you could plan a longer trip. You up root your family and move every few years but embrace it by discovering each new place you live. Some people never move their whole lives, what do you get out of moving? You get to see and experience new places. Look at the positive also you get to see more of the country and world than some people do in a life time. Make it a point to try discovering you new home town by finding a new mall or local book shop to check out, look for temporary work near by, or join an exercise boot camp to meet new people. Decorate your new house whether you live on or off base. Make your house, your home, your domain, your peaceful hide away. You put your big dreams on hold but embrace it by following through with your small every day goals that will eventually lead you to live your big dreams. Maybe your big dream is to get your degree but you can’t go to school full time. Try taking a few classes over time that you can manage that will lead your to you goal. Maybe your big dream to own your own business but you don’t have any money. Learn about what it takes to run a successful business. See if you can utilize any benefits you have as a military spouse to start a business. Maybe your big dream is to start your family but you can’t because your spouse is deployed or need to focus on advance schooling. Communicate and figure out when the best time would be to start a family. You can always read books, exercise and get ready for your future bundle of joy. Whatever your big dream is always know you can have it because you dreamed it. The path might be just a little bit different that you expected. Be flexible and if you have to comprise on how to obtain your big dream but okay with that. You miss out on having a normal relationship with your spouse but embrace it by seeing that your love story is different and awesome even if it isn’t normal. What is a normal anyways? Relationships change and grow overtime. Life and circumstance shape and mold your relationship. Change is good. Military spouses like you seek ways to keep on going when things are tough and your spouse is gone. No relationship is the same and maybe you can’t always go on a date or cuddle or eat dinner with your spouse but its only temporary. Remember the reason why your relationship isn’t normal at times, your spouse is defending our nation and you are supporting your spouse. There are realities we can’t always overcome. Look on the bright side of things. Keep your head up and take care of yourself! Embrace the bad while seeking the good. What are some realities you have faced as a military spouses and how did you embrace it? Leave a comment share your thoughts!